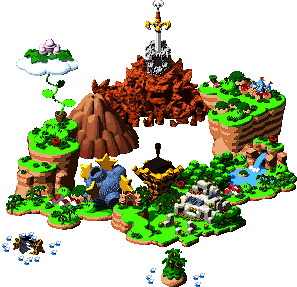 Marrymore is a marriage resort that only appears in Super Mario RPG: Legend of the Seven Stars. It is where Raz and Raini were going to get married, before Booster runs in for his wedding with Princess Toadstool. Mario, Mallow, Geno and Bowser all go into the resort to stop Booster and his Snifits. If Mario quickly finds Toadstool's missing accessories, she will kiss him; otherwise Mario may end up getting a kiss from Bowser and/or Booster, as both of them want a kiss from the princess as well. Just as Mario and Toadstool are leaving, Chef Torte comes in with a living cake named Bundt, which Mario fights. Afterwards, Booster eats the rest of the cake. Later on, after the adventure is complete, during clips of the various characters from the game continuing with their lives, there is a clip of Booster and Valentina getting married at Marrymore. Marrymore also has a large hotel, complete with the option (for 200 coins the first night and 100 coins thereafter) to stay in a luxury suite, complete with shower. Mario can continually sleep here, and rack up more cost than he can pay, and have to work as a bellhop for a while. This can let the player to get a Flower Box as a tip from a guest at the inn.